Predator 10x42 is rated 4.7 out of 5 by 89. Rated 5 out of 5 by Bennett from 10x42 predator After much research I finally decided to buy Steiner 10x42 Predator field glasses, and I wasn't disappointed the clarity is incredible, compact and easy to carry in the field. If you want the most bang for your buck these are for you, in my comparison to other brands that cost at least twice as much(sometimes like three times as much) these glasses do more than just hold there own. Highly recommended, makes me wonder how good Steiner optics are when you buy a more expensive pair. The only complaint is the strap and the ClicLoc system doesn't allow you to use your old harness or your homemade strap, but I'm sure I'll figure something out. Rated 5 out of 5 by Pappy from Best Bang For Buck I didn't want to spend thousands on a great pair of binocs so I bought the Predator 10x42 ($400) model. After weeks of tightening the noose on a 4 1/2 year old swamp buck, he finally made a mistake. While slipping around the edge of his bedroom in thick cedars, I saw a slight movement that I thought was a squirrel - my Steiner's allowed me to focus quickly on what was a tiny bit of his G-2 - at 10 yards no less. That information was priceless as I waited until he gave me a shot at about 17 steps. Much thanks to Jeff at Jay's Sporting Goods for helping me decide on the Steiner's. Rated 5 out of 5 by Charles from I bought my 10x42 stein eras about six years ago in South Africa (so the price was a little inflated) and have used them consistently since. They have been lugged around everywhere,experiencing bumps and knocks and getting dusty and dirty. They have never been anything but wonderful. Often, when being passed back from a friend using them(usually to see an interesting bird) they are accompanied by a comment that " these are great glasses" a feature that is not appreciated is that the eye cups not only keep out light but also act as a steady post against the face. I would only ever buy steiners again when these ever give up! Rated 5 out of 5 by wrwsouth from Super product and support I looked at these binoculars for months at a store that was closing, waiting for the best deal. When I finally bought them for what I thought was a very good price, I was happy. Until I got them home and realized that they were damaged goods. I contacted Steiner, and they could not have been more helpful. I sent them the binoculars, and they did not repair them, they replaced them immediately. They arrived yesterday, and are perfect. I am a former professional guide, and have looked through many brands and styles of optics. These Predator 10x42 rank among the best I have ever used. That makes them a great value. Thanks, Steiner. Rated 5 out of 5 by RBrumagin from Predator 10x42 I bought these a couple of months ago and haven't really had a chance to test them in the field. I'm a big hunter and the Predators are suppose to make it easier to pull the animals out of the surrounding terrain. I have looked through them and the optics are very crystal clear and stand up to any of my more expensive , which are all German optics by the way. They are compact and light weight which is a big plus, because hunting in Arizona is mainly spot and stock we don't sit in tree stands all that much. A lot of hiking and glassing. I can't wait until this fall when hunting season opens again and I can put these guys to the test. Rated 5 out of 5 by billys116 from After comparing this bino and a Zeiss in the store I felt like this one was the better value. I just got back from an antelope hunt and used them extensively glassing. They were awesome! The clarity of them was excellent in bright light as well as low light. I would recommend them to all of my hunting buddies. Would these be good for birding? No to ED Glass, Yes to BAK4 prisms, dielectric mirrors yes. Phase corrected - yes. I would recommend the XC over the Predator, as the coatings on the Predator are not conducive to astronomical observation. The XCs will allow you to see much more of the color spectrum. I bought a pair on sale from Bass Pro Shops, Predator Pro, it doesn't come with the eye cups and seems smaller overall! Is this a different BPS only binocular? The Predator Pro is an older model, with similar performance, but some minor cosmetic differences, including the lack of winged eyecups. Are the Predator Pros manufactured and assembled in Germany. &nbsp;Are any of the parts made in China or the Asian market. 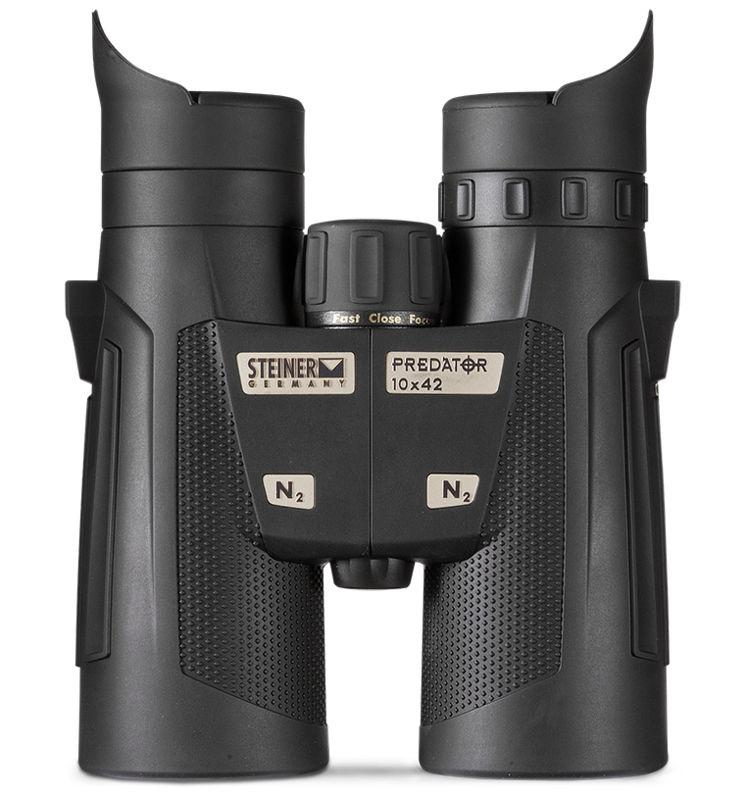 We import all of the Steiner binoculars from Germany. What is the nearest distance at which the predator 10x42 can focus on an object? Close focus is 6.5 feet. These are good for hunting, but what about bird watching? &nbsp;I am new to this arena and just wanted to check. Thanks! I would not recommend them for bird watching simply because the CAT coating might interfere with the viewing of certain color birds.